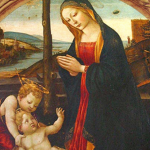 This painting is called “The Madonna with Saint Giovannino”. It was painted in the 15th century by Domenico Ghirlandaio (1449-1494) and hangs as part of the Loeser collection in the Palazzo Vecchio. 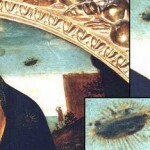 Above Mary’s right shoulder is a disk shaped object. Below is a blow up of this section and a man and his dog can clearly be seen looking up at the object. Upon closer inspection, the man seems to be looking away from the UFO, behind him and over his shoulder. 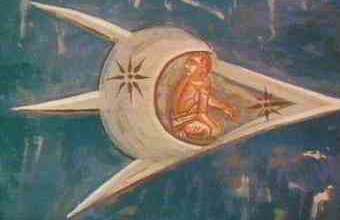 Or, more likely, the notably out of place object may be imagined floating above the ground between them. 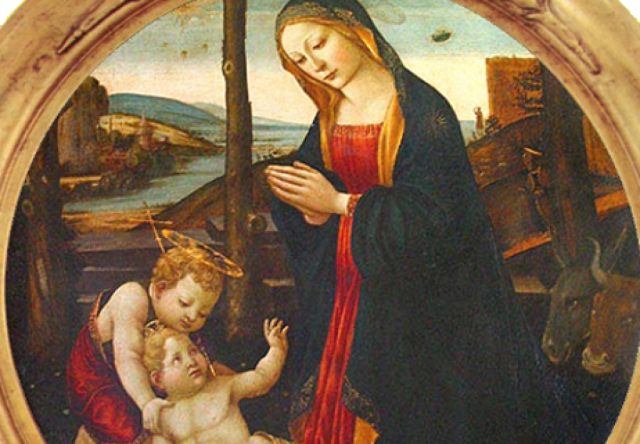 From either perspective, could Mary be seen as blocking the two babies from the flying saucer’s view? Perhaps the dog glimpses the hovering object ~ with it’s mouth open, it could even be barking at it. But what is that dark, sparkling, disassembled figure beside them ~ a dwarf, or an ethereal being? A body, legs, head, and tail can be made out. 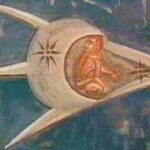 Could this represent a type of alien, or demon? 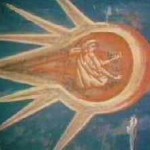 Also, Mary’s halo seems a bit shadowy ~ more like a vaporous disc than a ring of light. The Crucifixion” and was painted in 1350. 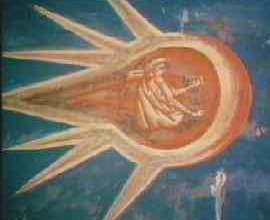 They are located above the altar at the Visoki Decani Monestary in Kosovo, Yugoslavia. Domenico Ghirlandaio is most often credited with painting the Madonna with Saint Giovannino during the 15th century. Ghirlandaio was born to a family in Florence during the Renaissance period in 1449. His father was a goldsmith and became well-known for making the metal garlands that renaissance women wore around their heads. Thus, the family acquired the name Ghirlandaio, “garland maker.” Domenico Ghirlandaio started out as an apprentice under his father. Giorgio Vasari, an art historian who lived during the 1500s, said Ghirlandaio used to paint the people who would go into his father’s shop. However, he later apprenticed with master painters and eventually set up his own art studio. His style of blending everyday scenes with religious themes (such as the one in the Madonna with Saint Giovannino) made Ghirlandaio very popular. He eventually became one of the most renowned Renaissance painters and was especially popular for his beautiful frescos. Although most articles credit Ghirlandaio, the true painter of the Madonna with San Giovannino is in dispute. Two artists also named as possible authors of the painting are Jacopo del Sellaio and Sebastiano Mainardi. Mainardi was an apprentice and brother-in-law of Ghirlandaio, who supervised Mainardi as his master. Their close association might explain why there is some confusion about the true artist. The Madonna with Saint Giovannino depicts the Madonna with the infant Jesus and Saint John. In the background there is a man with his hand held up to his face, as if shielding his eyes from a bright light. By his side is a dog with its mouth slightly open. Both the man and dog appear to be looking up at something in the sky. The object appears as a dark oval structure with light rays projecting out from all angles.